Foto van de Kerkhof is a true family business from Helmond, The Netherlands. The widespread use of digital photography has slightly tarnished the magic of making pictures. In the new interior design, the experience of times past resurfaces while maintaining a young, modern look. 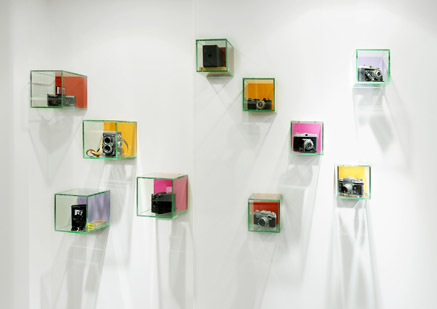 A remarkable collection of camera's decorate the wall and reflects the progress in the field of photography over the decades. In the design details of the legs of the counter and the machines for development, the theme of "pixels" appear, that form the basis of pictures. The fresh and daring colour palette is inspired by the visual identity that Foto van de Kerkhof had developed beforehand. LIkewise, we have aimed to create a modern and young identity identity for the interiour of the shop. The interior design design for Foto van de Kerkhof generated more than 20% turn over within half a year!!! Door interieur en corporate design in te zetten heeft Foto van de Kerkhof binnen een half jaar 20% meer omzet gegenereerd!! !